These two share a lot of love – best friends, roommates, partners in crime. 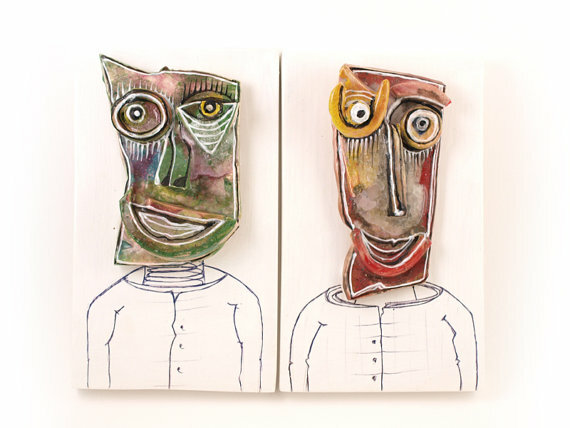 Each of them has his own individuality, yet they seem to share more common trades then usual – their faces are both made of white clay, which was later on glazed with ceramic glazes (one reddish, one greenish), then decorated in unison with each other. The faces are placed on white wooden boards with hooks on the back for easy hanging. They’re both dressed in an urban fashion style and have that special look on their face, which will bring bright and happy emotions into your home.